From this point of view, we can define a company as a unique collection of resources. This collection is not easy to replicate, and the differences between the quantity, share and quality of resources of different companies have an impact on the performance of them. If you work at a medium or large company, probably you’ve already heard of the term “Human Resources”. Companies usually have a department that recruits employees and deals with issues related to people, like paying salaries, onboarding, training, etc. 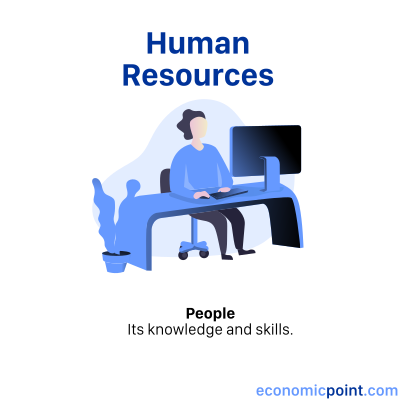 In this article, we are not talking about the human resources department, but to the people who work for a company, and to their skills, knowledge, culture and expertise. Human resources play a key role in every company because they have a great impact on its performance and the achievement or not of its goals. Human resources define company culture and company culture cannot be replicated. People not only acquire knowledge and skills by education but they also by experience and informal training. A major concern about considering people as a resource is that people should not be treated like another commodity or asset, that can be easily interchanged. Economics should have people at the core of its goals. People should not be treated like another company resource or as a simple factor of production, but with respect and dignity. Material resources are tangible goods different from human resources, that the company can use to achieve its goals. Technological advancements can make some material assets obsolete. Usually, computers become obsolete after some years. The same can happen with some business machinery: when a new better technology is implemented, it may be better to replace old machines than to keep using them. 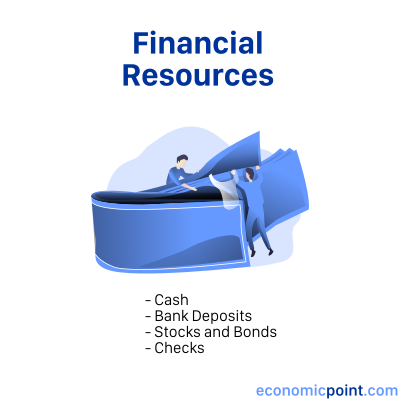 Financial resources of a company are the set of liquid assets available to the company. Liquid financial investments, like stocks and bonds. Good financial resources management is important to achieve the goals of the company. Situations where the shortage of funds can compromise the short-term operations must be avoided. For example, if the company doesn’t have enough funds to pay salaries or buy raw materials. On the other side, an excess of financial resources can lead to a high opportunity cost. For most companies, the main source of financial resources is the main business of the company. Usually, selling good or services. Intangible resources, also called intangible assets, cannot be touched or seen. 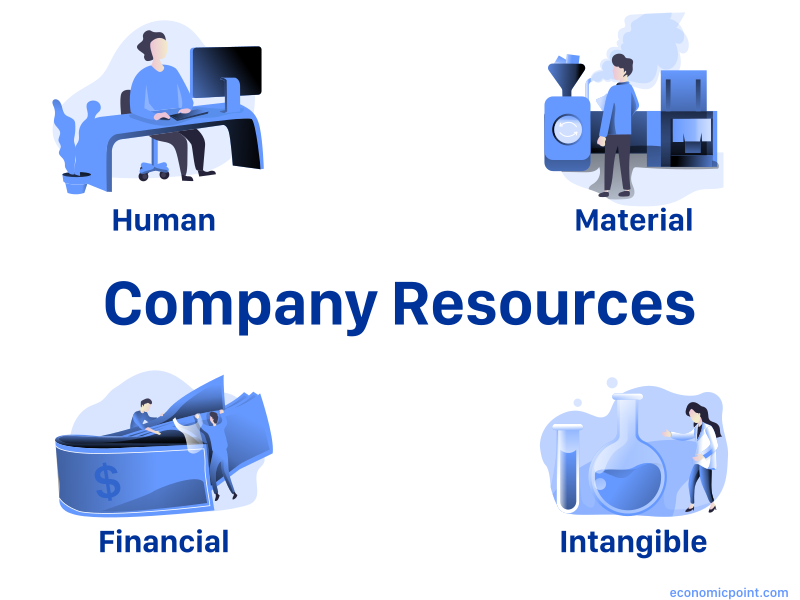 Intangible resources are not financial resources and cannot be associated with human resources. It is hard to measure the value of intangible resources. 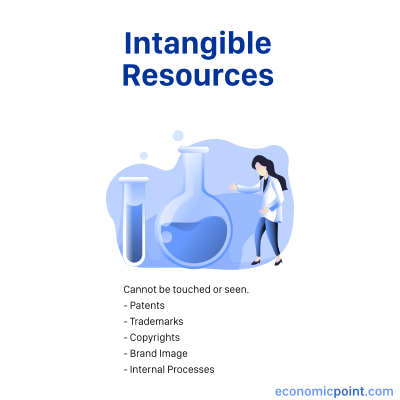 A big difference between intangible and material resources, besides the fact that intangible resources cannot be touched or seen, is that the value of intangible resources usually do to change when they are being used. For example, the value of a brand can increase over time. Another difference is that many intangible resources cannot be transferred to other companies. Some internal processes do have value only for the company that created them. 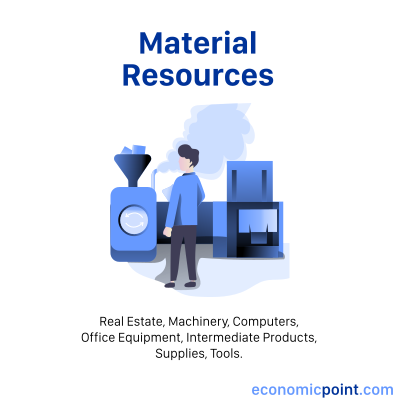 At some companies, material resources play a more important role than in others. For example, at an agri-business operation, real estate and machinery play an important role. At a consultancy firm, human resources play a more important role. Some companies rely heavily on intangible assets. For example, Coca-Cola formula has been a key asset to the company.